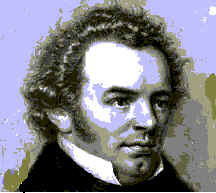 Schubert, Franz Peter (1797-1828), Austrian composer, whose songs are among the masterpieces of that genre and whose instrumental works reflect a Classical heritage as well as looking forward to 19th-century Romanticism. Schubert was born on January 31, 1797, in Vienna. The son of a parish schoolmaster, he became a choirboy in the Imperial Chapel in 1808 and began studies at the Konvict, the school for court singers. He played violin in the school orchestra. His first songs, among them Hagars Klage (Hagar's Lament, 1811) and Der Vaterm?rder (The Patricide, 1811), greatly impressed his teachers. When his voice broke in 1813, Schubert left the Konvict and began teaching in his father's school. The following year, he wrote his first opera, Des Teufels Lustschloss (The Devil's Pleasure-Castle); his first mass, in F major; and 17 songs, including such masterpieces as Der Taucher (The Diver) and Gretchen am Spinnrade (Gretchen at the Spinning Wheel). In 1815 Schubert completed his second and third symphonies and wrote two masses, in G and B-flat major, other sacred works, some chamber music, and 146 songs, including Erlk?nig (Erl King), based on a mythological figure of death. That year, he also worked on five operas. In 1816 he wrote his Symphony in C Minor, known as the Tragic Symphony (No. 4), the Symphony in B-flat Major (No. 5), additional sacred music, an opera, and more than 100 songs. About this time Schubert gave up teaching, devoting himself exclusively to composition. Not a success with the general public during his lifetime, Schubert was recognised as a composer of genius by a small circle of friends, among them the poet and playwright Franz Grillparzer and the singer Johann Michael Vogl. In 1820 Schubert wrote music for Die Zauberharfe (The Magic Harp), a melodrama, and Die Zwillingsbr�der (The Twin Brothers, 1820), an unsuccessful singspiel (a type of light German opera with some spoken dialogue). He also composed sacred music such as the Twenty-third Psalm and the unfinished oratorio Lazarus. A group of his songs was published in 1821. In 1822 he wrote the Symphony in B Minor (No. 8), known as the Unfinished Symphony, and the Mass in A-flat. His song cycle Die Sch?ne M�llerin (The Miller's Beautiful Daughter) was composed in 1823 and the Octet and Songs from Sir Walter Scott in 1824. For the next two years Schubert wrote constantly, producing the Symphony in C Major (No. 9), known as The Great in 1825, and the song cycle Die Winterreise (Winter's Journey) in 1827. The Mass in E-flat Major, the String Quintet in C major, his last three piano sonatas, and his last and greatest group of songs, published after his death under the title Schwanengesang (Swan Song), were written in 1828. Schubert died on November 19, 1828, of typhoid fever. Schubert's early instrumental works, which follow the patterns used by Wolfgang Amadeus Mozart and Joseph Haydn, are marked as Romantic by a new sonority and a harmonic and melodic richness. In his early piano sonatas, Schubert worked to free himself from the influence of Ludwig van Beethoven. Although he cast his symphonies and sonatas in classical outlines, in their development sections these works rarely achieve the dramatic tension that is the core of the Classical sonata form; instead they tend to emphasise expansive melody and evocative harmonies. Schubert's instrumental works show development over a long period of time, but some of his greatest songs were composed before he was 20 years old. In Schubert's songs the literary and musical elements are perfectly balanced, matched on the same intellectual and emotional level. Although Schubert composed strophic songs throughout his career, he did not follow set patterns but exploited bold and free forms when the text demanded it. His reputation as the father of German Lieder (art songs) rests on a body of more than 600 songs.